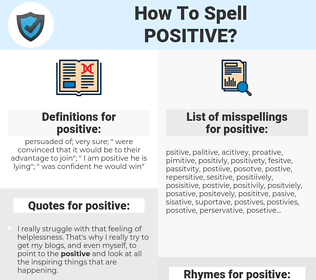 What are the misspellings for positive? What are the common mistypes for positive? What is the definition of positive? What does the abbreviation positive mean? 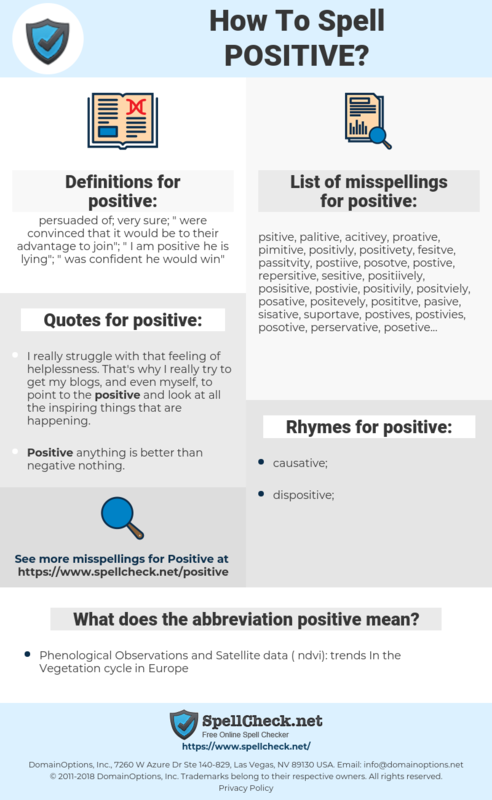 What are the quotes for positive? What are the rhymes for positive? What are the translations for positive? What are the common typos for positive? persuaded of; very sure; "were convinced that it would be to their advantage to join"; "I am positive he is lying"; "was confident he would win"
This graph shows how "positive" have occurred between 1800 and 2008 in a corpus of English books. ポジティブ, 正, 前向き, ポジ, 肯定, 積極, まえむき, 実証的, せっきょく, じっしょうてき.